The Griffon is an attractive, happy little dog with terrier instincts, and an inflated sense of self worth. He is a square, solid looking dog with a rounded head and a short snout. The whiskers and beard of the Rough-Coated Griffon variety give an almost human expression. The Smooth-Coated Griffon looks a little less solid and his arrogant expression belies his loving and amiable disposition. Various breeds are mentioned as having been used to obtain the Griffon of today. It is possible that it is derived from the Affenpinscher, to which it bears a facial resemblance, and the Pug may be responsible for the smooth coat. He was originally the rodent catcher of the stables in Brussels and rode on the hansom cabs as the driver’s friend. However, it took the fancy of royalty, and Queen Astrid became an enthusiastic Griffon owner, thereby increasing the popularity of the breed. The Griffon comes in three colours; Red, Black, and Black & Tan. 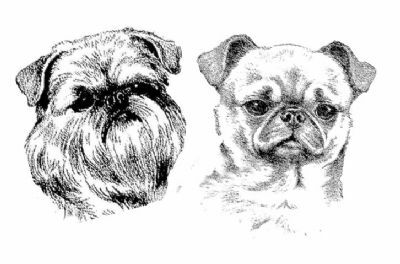 There are two very distinct coat types, the ‘Rough’ - Griffon Bruxellois (pronounced Bruce ell waa), and the ‘Smooth’ – Petit Brabancon (pronounced Brab an son). The Griffon is very much what you make him. If you have children, the dog will enjoy their games and going for energetic walks. If you are older and your daily pursuits are more leisurely, the dog will grow up more sedate and become a close and loving friend. Griffons are very easily trained and many Griffons have Obedience and Agility titles. The Rough-Coated Griffon requires regular grooming with a brush and comb. He will ned a regular groom around his eyes, bottom and feet and twice a year he will need his coat stripped (if you are showing), or clipped, if he is a pet. The Smooth-Coated Griffon need a minimum of brushing but this does not mean that they can be left without any care. Be careful about using flea collars on your Griffon; always air well before use. There are a number of alternatives available on the market which are very effective in controlling fleas & ticks. Consult your vet as to the best choice for your puppy. Fussy feeders are generally made that way by their owners!! Decide what you want the dog to eat (remembering to make sure it is a well balanced diet) and do not give in to pleading looks. Do remember that he will NOT starve if he does not eat for a few days. A good small sized dry food and either canned food, or fresh meat & veggie mix will be fine. If you plan to feed a raw diet do investigate what this involves to ensure your puppies diet is balanced. They also love RAW chicken necks, which are very good for their teeth and general health. Do make sure to supervise your Griffon if feeding chicken necks and do not give them overly large necks. Also make sure your Griffon is not a gulper of his food as he may swallow the neck whole and choke on it. Of course, all puppies will need extra meals whilst growing, and your veterinarian will advise when you take the puppy for those most important vaccinations. Griffons as a rule do like their food and can convince you that they are starving with those big mournful eyes so do be careful not to overfeed and do not give them lots of little treats. Feel the body of your Griffon. You should be able to feel the ribs without having to poke and prod. If you cant then you may be overfeeding your Griffon and for a puppy that can be as detrimental as underfeeding as you are placing too much stress on growing bones. Grow them slowly and carefully. Griffons will take just about as much exercise as most owners are willing to give, but they are just as content to be couch potatoes if it suits you. As a puppy you must not over exercise your Griffon as their bones, joints and ligaments are growing. Too much exercise or the wrong type of exercise can lead to lifelong issues such as luxating patellas or hip problems in much the same way as a larger breed puppy can. This includes limitng play with older, more agile dogs or larger breed dogs, not allowing your puppy to run up and down fence lines and twisting and turning, limiting their ability to jump on or off heights greater than 2/3 their height and simply jumping up at you all the time. All these things can place pressure on growing bones and cause damage to your puppy. Short walks where your puppy can stop and smell the 'roses' is most desirable as well as short play sessions at home. Breeding is often an expensive hobby!! From one to three puppies is average, however, litters of six or more have been known. As they are a small breed there can be complications in whelping, requiring a caesarean to be performed. Rearing Griffon puppies is often not easy, but once they reach six - eight weeks of age, they develop into tough little dogs, that as a breed have very few major problems. This can mean that you may need to wait patiently to get your new Griffon puppy. Be patient- do not rush out and get the first one available as you may be buying a puppy that is both expensive to purchase and more expensive to maintain throughout its lifetime. Do contact our puppy enquiry person, Beth Canavan who can discuss your needs and direct you towards breeders within our club who have puppies available or are planning a litter in the near future. Griffons prices vary anywhere from $2000.00 - $3500.00 approx. A puppy bred by a breeder who does extensive health testing of the dams and sires and provides documented evidence of these test results may cost up to $3500.00. The average cost as at May 2018 is $3000.00. Breeding a litter can incur many costs. A reputable breeder breeds for the future of the breed and never breeds to make a profit from their hobby. The price for a puppy should reflect the value that society places upon a breed but not be so exorbitant that buying a puppy is out of the price range of most. Always be prepared to ask a breeder about their dogs, the reasons they have bred these particular dogs, the lineage of the dogs and health tests conducted on the dam and sire. If you “only want a pet”, remember that this breed is often expensive to produce, and that you are buying a very special little dog. Keeping in mind that it costs the breeder the same to produce your “pet” as it did a show potential puppy. All puppies sold by members of this club and Dogs Victoria must come with pedigree papers from Dogs Victoria and these papers should be included in the price. This price should not be increased if you want pedigree papers. Contact the club if you are in doubt. We are here to advise all those who need support and guidance. Older dogs are sometimes available to the Right homes. If you feel that you qualify, and would prefer an older dog, please contact the club and you will be placed on a waiting list. Be very wary of a breeder who professes to fully health test their dogs but is not prepared to give you the results of such. Health tesrs should include such things as ACA eye testing, knee and hip scores, heart and in some cases MRI scan results testing for SM/CM. ( see our heaslth document for explanantions of these tests) It does not mean just an annual check up at the vet. Griffons are very adaptable little dogs, however, they are a small breed, even though they are sturdy for their size. They will fit very well into considerate families with young children, as well as being ideal companions for older people. The Smooth-Coated Griffons do not need the same coat care, as do the Rough-Coated Griffons, so if you are taken with the Griffon character, but could not manage the longer coat, then a Smooth-Coated Griffon is the right dog for you.